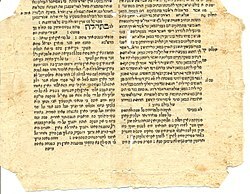 A page number in the Vilna Talmud refers to a double-sided page, known as a daf, or folio in English; each daf has two amudim labeled א and ב, sides A and B (recto and verso). The convention of referencing by daf is relatively recent and dates from the early Talmud printings of the 17th century, though the actual pagination goes back to the Bomberg edition. Earlier rabbinic literature generally refers to the tractate or chapters within a tractate (e.g. Berachot Chapter 1, בר��ות פרק א׳). It sometimes also refers to the specific Mishnah in that chapter, where "Mishnah" is replaced with "Halakha", here meaning route, to "direct" the reader to the entry in the Gemara corresponding to that Mishna (e.g. Berachot Chapter 1 Halakha 1, ברכות פרק א׳ הלכה א׳ would refer to the first Mishnah of the first chapter in Tractate Berachot, and its corresponding entry in the Gemara). However, this form is nowadays more commonly (though not exclusively) used when referring to the Jerusalem Talmud. Nowadays, reference is usually made in format [Tractate daf a/b] (e.g. Berachot 23b, ברכות כג ב׳). Increasingly, the symbols "." and ":" are used to indicate Recto and Verso, respectively (thus, e.g. Berachot 23:, :ברכות כג. These references always refer to the pagination of the Vilna Talmud. In the Vilna edition of the Talmud there are 5,894 folio pages. ^ "Palestinian Talmud". Encyclopædia Britannica. 2010. Retrieved August 4, 2010. ^ Friedman, "Variant Readings in the Babylonian Talmud – A Methodological Study Marking the Appearance of 13 Volumes of the Institute for the Complete Israeli Talmud's Edition," Tarbiz 68 (1998). ^ "Introducing: Talmud in Arabic". Ynetnews. 19 May 2012. ^ "Talmud (William Davidson)". sefaria.org. Retrieved 4 June 2017. ^ "With full Talmud translation, online library hopes to make sages accessible". jta.org. Jewish Telegraphic Agency. 2017-02-07.